Captain Jason Quintano and clients Tom Rued and Rob Hummel show off the 57 1/4-inch musky. 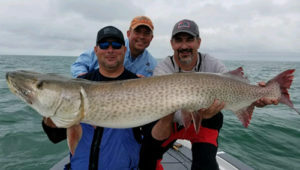 Quintano’s musky ended up measuring 57 1/4 inches long and is the new Michigan Ontario Muskie Club record in its release division, thus making it the longest known release for fabled Lake St. Clair. Quintano, 40, of St. Clair Shores, Michigan, grew up on Lake St. Clair and has fished for muskies for about 30 years. He has run Fins & Grins Muskie Charters for the past 10 years, but never before had he put a musky in the boat as large as the one he got August 16. Joined by clients Tom Rued and Rob Hummel of the Appleton, Wisconsin, area, Quintano set up his boat to fish over cabbage weeds in about 18 feet of water. 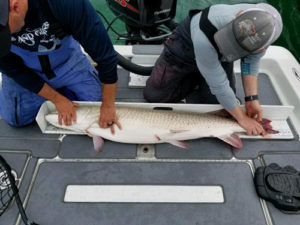 The muskies in the area were targeting schools of gizzard shad that measured six to eight inches long, he noted. The anglers were still in their first drift of the day and had already boated a musky when Quintano felt a “tick” on his line as a fish hit his Pounder Bull Dawg. Quintano said it was likely the third time he brought the musky to the boat when Hummel made a big scoop with the net and secured the fish. Both thought the musky would measure between 53 and 54 inches until Quintano picked it out of the net. Charter Captain Spencer Berman was about a quarter-mile away and immediately drove his boat over to Quintano’s, then jumped in to take photos. They didn’t weigh the fish, but Quintano said it had a 22 1/2-inch girth. “I would estimate it weighed 40 to 42 pounds,” he said. Quintano and Hummel measure the musky on the bumpboard. After photos, they released the giant. Quintano said his largest musky prior to this was a 54 3/4-inch fish, though a client once caught one that measured 55 5/8 inches. Quintano said his Bull Dawg was painted in a sucker pattern with an orange tail. He was using a Stealth fluorocarbon leader, a nine-foot Chaos Shock & Awe rod and an Abu Garcia Revo Toro Winch reel.